Please contact us for availability, or drop by if it's convenient. Junior Karate is our program for children ages eight through thirteen. The juniors practice the same karate as adults and must learn all of the same formal katas and kihons but the emphasis is on fun, respect, and self control. 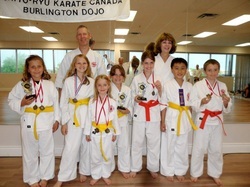 Juniors also learn sparring ( kumite ) and may compete in local and provincial competitions if they wish. An hour of karate generally consists of 20 minutes of sparring exercises designed to develop the students' agility, balance, fitness and flexibility. This is followed by the entire class practicing basic techniques such as stances, blocks,punches and kicks. The final 20 minutes is devoted to each child working toward his or her karate goals ( i.e. next belt level or improving a certain skill ). The formal 'bowing in and out' ceremony is a traditional aspect of all Japanese martial arts. It denotes respect to the past ( our founders ) the present ( class instructors ) and the future ( students ) of karate. This is also a time where students learn to control their bodies and stand quite still for a few minutes. Self control is a key value we instil in our students. Our karate parents are welcome to work out with us while their child is training. We have Dads and Moms currently learning karate. Parents are placed at the rear of the group so as not to distract their child, and not to be embarrassed by any lack of flexibility or conditioning. Parents, if you have to be here anyway, take some time for yourselves and join our family karate class! Ask about our family rates.